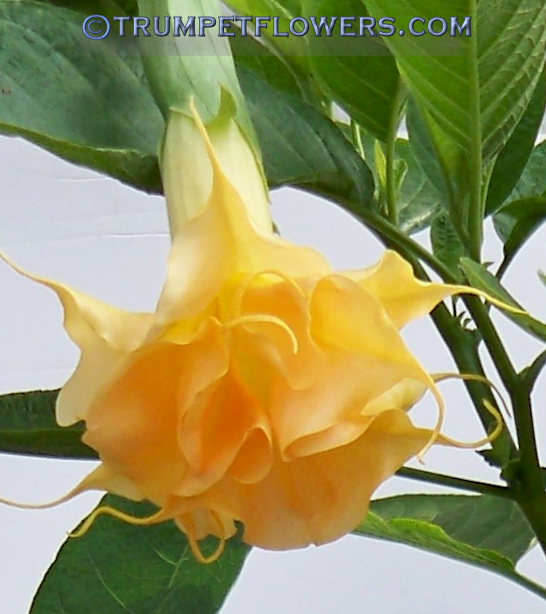 Brugmansia Goldflame with her first bloom for me. Perfect! 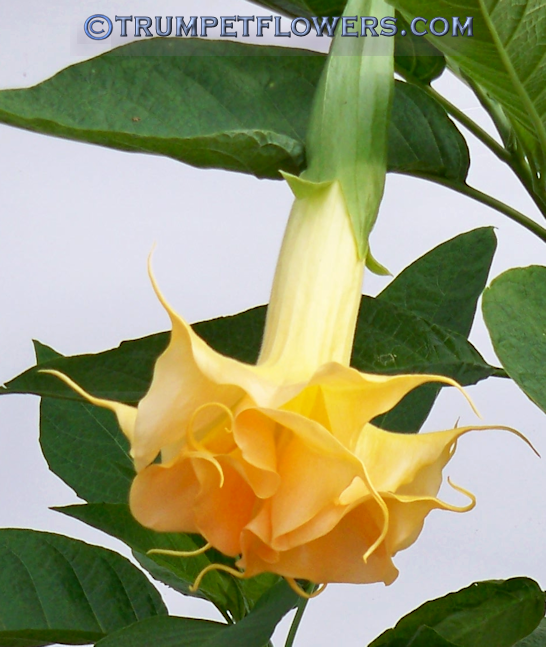 Gold Flame. Golden Sunset X Carly. 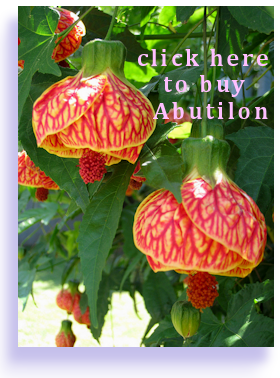 A beautiful new German cultivar by Dorothea Langenberg. 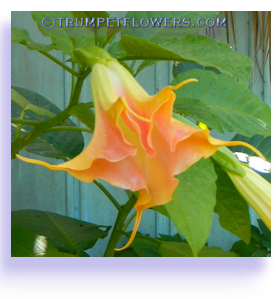 Angel Trumpet Goldflame smells like citrus candy. 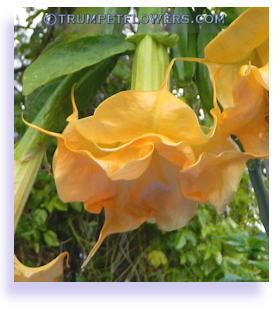 Parentage is Golden Sunset X Carly and bred by Dorthea Langenberg. 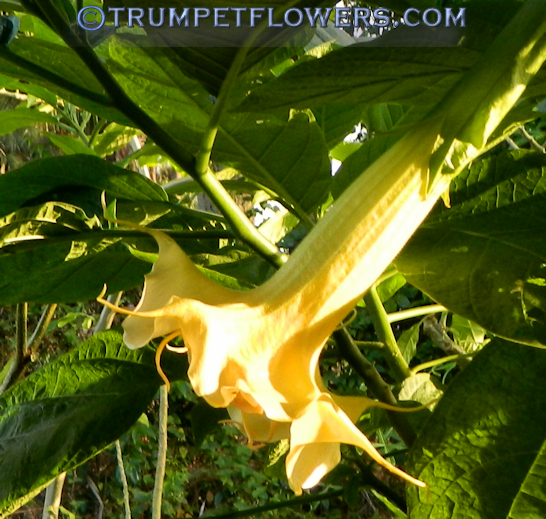 I have noticed that because (I think) it is a newer cultivar of Angel Trumpet, it roots vigorously and is quite strong, a plus indeed. Published in 2006. 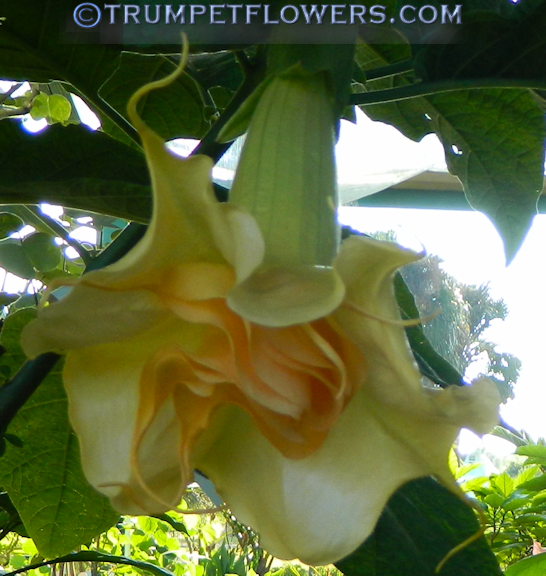 On this glorious fall morning, Angel Trumpet Goldflame has shown me another stunning bloom. 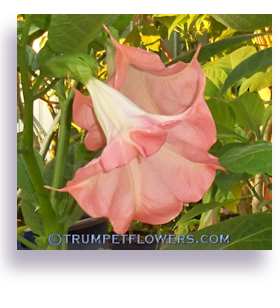 Goldflame Brugmansia is a medium sized Angel, mine being young, and a height of about 5 feet. 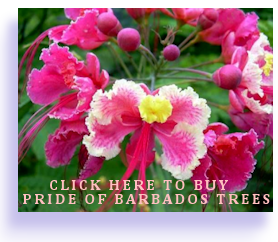 She will get taller as she layers out more branches, but her Y shape is right at about 2 1/2 feet. 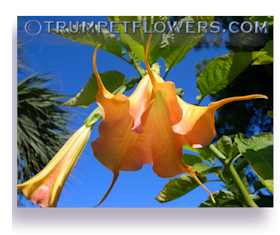 Trumpet Flower tree Goldflame is definitely a cultivar that any serious brugmansia fanatic should try and have. 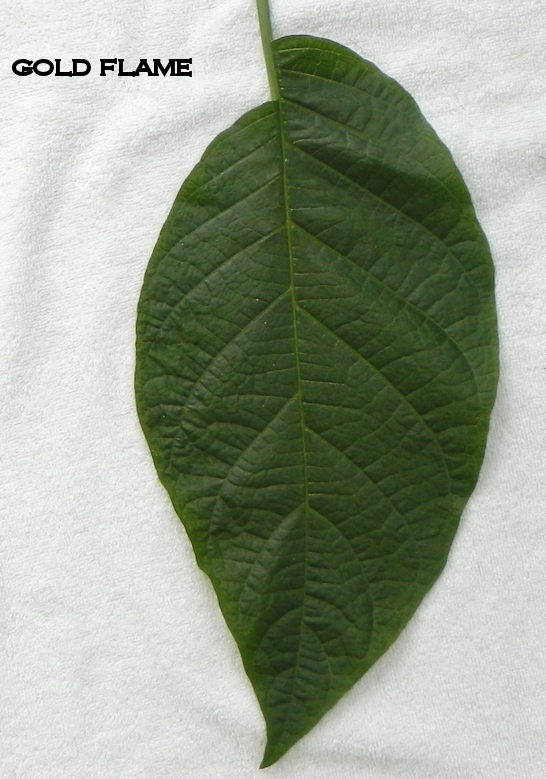 Goldflame has large, shiny green leaves. 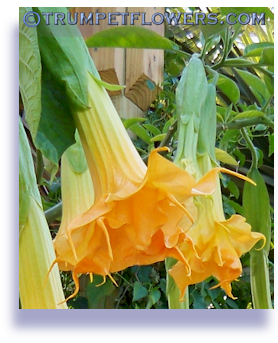 Here is Gold Flame bloom a few days later, October 22nd, 2013. 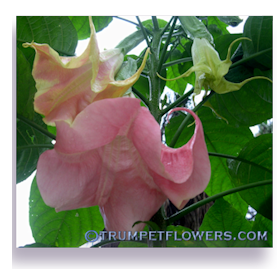 Her creator, Dorothea Langenberg, has sadly departed this world. On October 10th, 2013, we lost this grand woman&apos;s talent to the next world. You will be sorely missed. 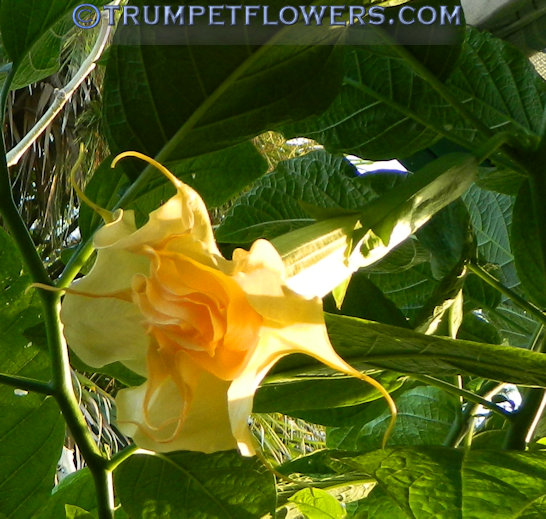 The leaf of Angel Trumpet Goldflame is large, deep green and smooth to the touch. 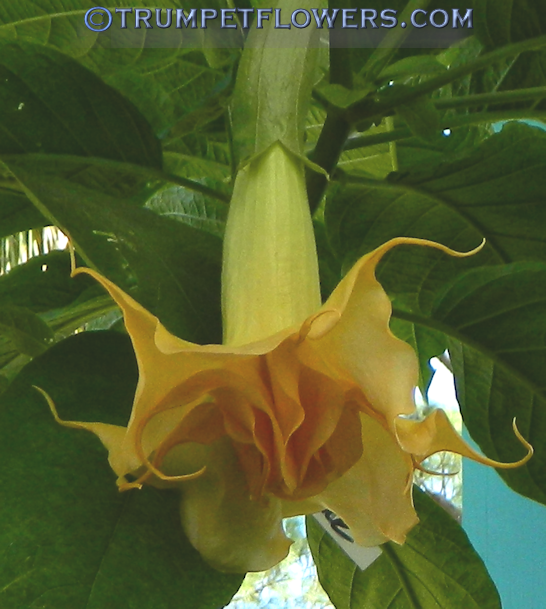 This entry was posted on April 18th, 2013 and is filed under Brugmansia Gallery.